Manchester United boss Jose Mourinho has played down the reports which claimed Anthony Martial was on the verge of extending his stay at the Old Trafford club. The France international slipped down the pecking order following Alexis Sanchez’s arrival, and never recovered. The resultant lack of game-time eventually cost him a place in the 2018 World Cup winning French squad. In the summer that followed, the youngster’s representatives publicly admitted that Martial was looking for an exit, but the Red Devils refused to let him leave, as no club was willing to meet his enormous valuation. The winger has since stayed put at the Mancunian outfit, despite not being entirely happy under Jose Mourinho, who fined the starlet for not returning to the pre-season tour on time following the birth of his son. Meanwhile, newly emerging reports have claimed that Manchester United had opened discussions with the France international over a new long-term contract, against Mourinho’s wishes. Martial’s current deal lasts until 2019, with an option to extend for a further year. Mourinho was asked about these reports during the pre-match press conference ahead of United’s Premier League encounter against Burnley. But the Portuguese tactician replied with a short non-answer, and went on to talk about Luke Shaw’s recent impressive performances instead. 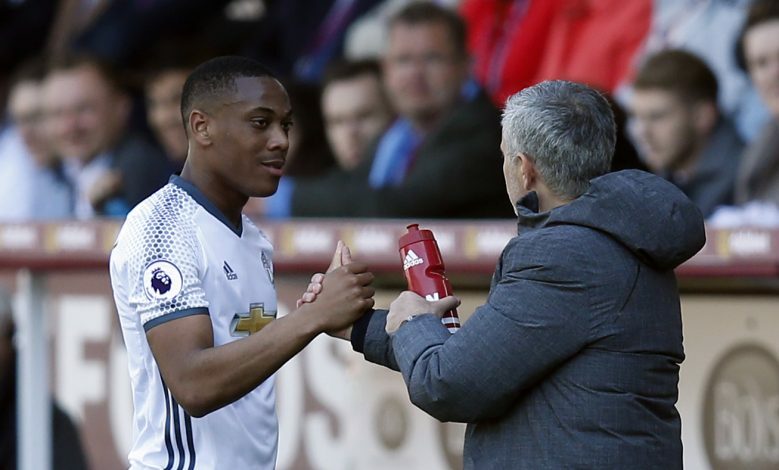 “With Martial, you have to wait for that to be official because in this moment is not official,” said Mourinho (via Manchester Evening News). Martial was dropped by Jose for United’s 3-0 home defeat at the hands of Tottenham, but the wide-man could be in contention for a spot on the bench, if not the starting lineup, in the Reds’ upcoming away game at Turf Moor. It also remains to be seen whether the 22-year-old will accept the new contract offer from United, or simply secure an exit in the upcoming transfer window.